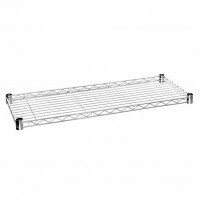 Great range of chrome shelving with quantity discounts of up to 50%. Large stocks available for next day despatch. 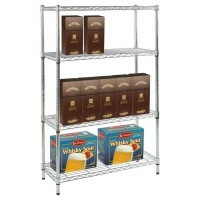 We have selected a wide range of Chrome Shelving units to compliment your retail environment. Available in a selection of popular heights our chrome shelves are high quality units, made to make an impact. We offer next day despatch on our shelving units, and as specialists can offer discounts of up to 50% when buying in bulk. We stock a wide range of high quality chrome shelves at discounted prices, giving you choice over style and budget. Our chrome shelving units come in four different heights; 900mm, 1370mm, 1625mm and 1800mm. Within each height category is a selection of widths and depth configurations in order to suit your space requirements. As well as the pre-configured chrome shelving units, we also stock individual shelves and poles, meaning you can easily expand on existing shelving racks, or can create your own from scratch. Ordering is simple and secure with a variety of payment options available. 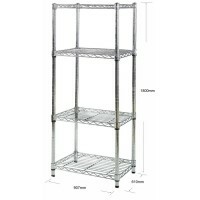 Perfect for stock rooms, warehouses, front of store, offices or personal use, our chrome shelves are designed to be able to take heavy loads with the majority about to support 250kg uniformly distributed per shelf. You can also use shelving to great effect as part of your in-store marketing display with pop up stands, printed graphics and display stands. 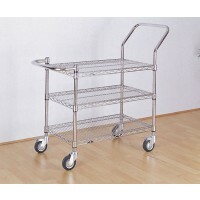 All our chrome shelves and components are delivered next working day by couriers chosen for high customer satisfaction. There are also discounts for buying our chrome shelving displays in bulk, making furnishing your stock area quick and affordable. Assembly for our shelving units is straight forward, no tools or expertise are required and the whole unit can be put up in a few minutes. If you want to expand one of our shelving units you can purchase extra shelves which simply attach to the existing shelves.